Sheriff Street – Dublin 1, where the video for ‘Sometimes you can’t make it on your own’ was partially filmed. Rosemount Avenue – Dublin 5, childhood home to Larry Mullins, U2. You can also personalise a street sign with whatever street name you want or indeed whatever wording you like. We had a request for a street sign with iNNOCENCE + eXPERIENCE TOUR, nice idea. You can also choose from 2 sizes and 2 colours; blue or green. 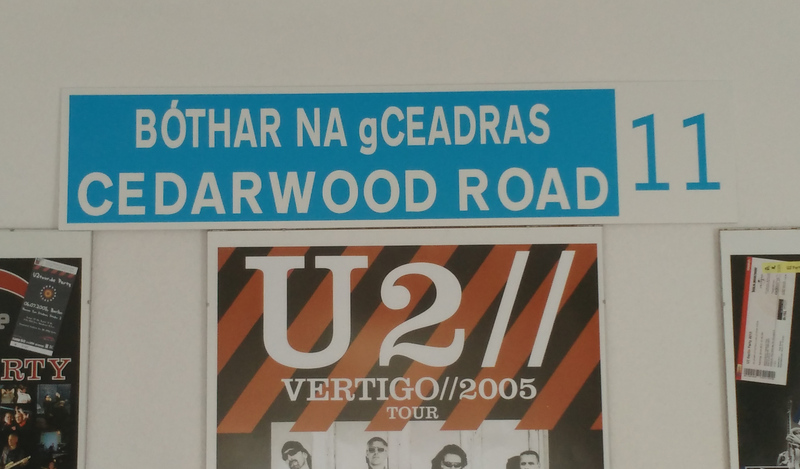 u2 tour de are giving you the chance to WIN a Cedarwood Road sign by simply answering a very easy question. Why not enter the competition today or visit our shop to order your street sign Now!